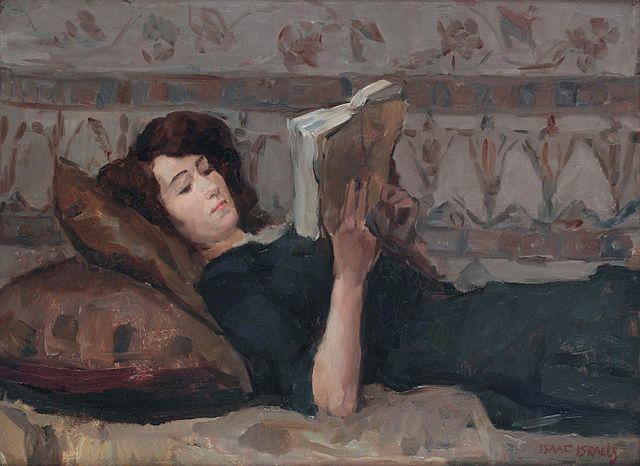 Reading Woman on a Couch by Isaac Israels. Mostly I’m continuing to read Brothers Karamazov and Can You Forgive Her. The Brothers Karamazov I first read in Lent of 2011. Anthony had just been born and I finished the whole book that Lent, as I recall. And that’s about all I recall (and I needed help from my blog post at the time to give me those details.) Even though I know I read the whole book, I don’t think I absorbed much of it at all. I didn’t have any way to process it. I wasn’t talking about it with anyone or writing about it. And so very little of it settled in long term memory. I remember the fact of having read the book and some of the details are familiar. But in many ways I feel like I’m reading it for the first time. This time I’m getting a lot more out of it. Reading with a Facebook group has been fun. I’ve often been a week or two behind the group’s schedule (I finally caught up.) And that’s actually not been a bad thing. Reading other people’s comments has given me a sort of scaffolding as I read, questions to ponder, hooks to keep my attention. Also, I really like this translation. Last time I used the Constance Garnett translation that I bought for my Russian novel class back in college– I dropped out at midterm because I was overloaded and I couldn’t handle reading both Anna Karenina and Brothers Karamazov while also juggling Shakespeare and my Junior Poet Project. But I was very sad at dropping out because that class was taught by the redoubtable Dr Cowan. So this time I’m using the translation that several people had recommended, by Richard Pevear and Larissa Volokhonsky. I’ve been finding it very readable, much more engaging– and I don’t think it’s only that I’m not fighting against newborn mommy brain this time. I still don’t think Brother’s K is going to be among my favorite novels, but I’m glad I dove in to this reread because I do appreciate it much much more. This is my first time reading Can You Forgive Her (I’m reading the free Kindle version) and my first Trollope novel and I had no idea what to expect. Actually, I still have no idea where this book is going. It’s quite fun to read a book like that. My main problem here is that I want to leap far ahead of the group and I’m having to restrain myself a bit to keep from gobbling it up. I’ve been occasionally dipping into Chernow’s Hamilton. It’s a book that works well at a slow pace. I know the broad outlines of his life well enough (thanks to the musical) that I can pick it up and put it down without losing the thread of the narrative. And yet it’s new and interesting enough to keep my attention when I do pick it up. I expect at some point I’ll pick up the pace and focus only on Hamilton for a while when my reading slate is a little clearer. Maybe. I finished reading The Haunting of Hill House by Shirley Jackson and Unnatural Death by Dorothy Sayers. This is part of the reason I fell behind in Brothers K. Several people have been talking about Hill House lately and my curiosity was piqued. When it came up for sale on Kindle I snatched it up and then I read it in a couple of bursts. I probably read it too fast, but I wanted to just get through it. I didn’t really savor the horror of it properly. I might come back to it again later. I want to go back and read what people were saying about it, too. The Sayers is part of a larger attempt to re-read all of the Lord Peter Wimsey books. A friend has newly discovered Sayers and I realized I hadn’t read most of them in over twenty years. So it was time to cast a fresh eye on them. So far I have not been disappointed. I wish I’d picked them up in order, but oh well. In addition to all the above, I’ve been reading books about poetry/prosody: dipping into Nine Gates by Jane Hirshfield, which is lush, but required a bit more attention than I can spare it. It feels like a book that wants to be read at a cafe on a long sunny summer day with a notebook and a pen beside me and no interruptions from anyone. Rules for the Dance by Mary Oliver, which turned out to be not exactly what I was hoping for, too much like every other book about prosody I’ve read and not really as much of the author’s presence as I’d hoped. The Hirschfield is much better in that regard. I’ve been very appreciative of The Practice of Poetry by Robin Behn and Chase Twichell eds. It’s a collection of writing exercises and the prompts have kept me busy. I’ve written a bunch of exercises and had a few poems come from them that I’m actually quite pleased with. Even though I’m a little disappointed in the prompts in the section about form, they really don’t offer the insights into how to approach form that I was hoping to find, still, the book has been very useful in other ways. I started reading The Problem of Pain by C.S. Lewis with a friend’s reading group and after the first chapter realized I really wanted to outline it and write about it and engage with it in a much more focused way and not just whiz through it. But… I have all these other books vying for my attention. So poor Lewis has slipped onto the very far back burner. Oh well. I did think it was rather ambitious of me. I finished reading A Wrinkle in Time with the kids and began reading A Wind in the Door. They are just as satisfying as I remember and the kids have very much enjoyed them. Dear Meg. I wish L’Engle and other writers didn’t beat quite so hard on the brown hair is unattractive drum– that was one lesson I absorbed as a child. Between Laura Ingalls Wilder and Madeleine L’Engle, I learned that my brown hair– and later glasses and braces– meant I was plain and unattractive. Sigh. I like my hair now, but as a child I learned that it was not an admirable color. I hope that my commentary counteracted that a bit. I want to write more about how well Wrinkle stands the test of time, but I think that may be a blog post for another day. I found a Kindle sale on Jonathan Strange and Mr Norrell, which my sister recommended to me years ago. I read a few chapters and decided to come back later when I’ve got less on my plate. Audiobooks: I’ve been listening to Emily Wilson’s translation of The Odyssey in snatches here and there, often when I’m in the car alone or with just one of the kids. I figure since they know the story they can stand to jump in and hear a bit here and there– it’s the kind of story that you are meant to not hear all in one go, but to listen to in snatches. Anthony thought the Cyclops scene was unnecessarily gory and gross. When all the kids are in the car together we’ve been listening to The Saturdays, which is such a delightful novel. Funny about the brown hair– I was just explaining to John the problem of being a short round brunette young woman who had tall blonde friends. I think “Brown hair is unnattractive” happens because…. it’s true. When you’re young everyone dances attendance on the blondes and ignores the brunette friend. I’m not sure why. John points out that, from what historians can discover, the short, round brunettes actually seem to be better at producing large numbers of living children, so the blondes really shouldn’t be preferred…. But they do have more fun, when they’re at the age for having fun. “Brown hair is unnattractive” happens because…. it’s true. Well, sure. But juvenile novels walk a balance between showing the world as it is and helping young readers to see the world as it should be or could be. The message in the books as they are seems to be trying to help young readers understand that the protagonists have an inner beauty. But I think you can show that while still showing that external beauty comes in many shapes and sizes and colors. The fact is there are many stunningly beautiful brown haired women. Plenty of brunette movie stars that are ogled and fantasized about. It might be true that more exotic colors get more attention on the whole, but it’s not true that brown equals mousy and plain and unattractive. But even more than that my problem with books aimed at young girls that emphasize the plain brunette trope… is that life doesn’t *have* to be like that; but even if it is like that… even if brown hair is denigrated and blondes get all the attention in real life… books can still send girls a different message, take them to a world where their kind of beauty is appreciated. When I was a girl I wanted long braids like Laura’s. I didn’t even care that my hair was brown, I wanted braids! But at the same time I think I did absorb a message that I was plain that later I unpicked. As an adult I came to not just accept my brown hair. I came to really and truly like the way I looked. But as a parent reading the books aloud I just wanted Ma or Mrs Murray to say even once to Laura or Meg: you’re really beautiful, I love your hair, it’s quite lovely. Just once let someone in the novels voice the kinds of things my husband says to me: you are beautiful just the way you are. And my parenting take away from those books and from my childhood in general is that when I brush and braid my girls’ hair I tell them they have nice hair. I tell them their hair looks beautiful in the sun, has fun little curls, has beautiful sheen, looks elegant, etc. etc. There are so many nice things you can say about brown hair instead of disparaging it. I think girls should be praised for more than their looks, and sure inner beauty is more important… but I also think it’s not a bd thing to point out their good qualities to them. I think my kids are gorgeous and so I tell them so, honestly and frequently.